I have a new adventure I wanted to tell you all about. I have a YOUTUBE channel now! WHAT!?! This is totally new and I wanted to share some tips that I have with clean eating and sometimes it is just easier to tell you about it than writing it down! I won't be vlogging all the time just on some stuff so make sure you check it out. And that you subscribe to keep up to date on what I am doing! It is small right now with only 2 videos but over time it will grow and I hope that you will join me over there too. I really am a real person. Sometimes it might seem that I am just someone story teller and yes I post pictures of me and my family but it is nice to see that I really do exist in real life. I fully believe that we all need some motivation. And I plan on doing some motivation type videos to help give you that push to get up and go for a run or do your workout. I really hope that you guys can see a whole new side to me. Here is my most recent video that I did. One thing that I have written about is that last Friday I had oral surgery. For the past 8 years I have been told that I would eventually need a gum graft. Well that day has come and I had it done this past Friday. I made this video on Monday so I am still having a hard time talking and I can't smile at all (I know you will miss my big smile! My favorite feature!) But still I think the video is pretty educational on how to add greens into your daily Shakeology or Green Smoothie without having to have a salad. And it is cost effective. 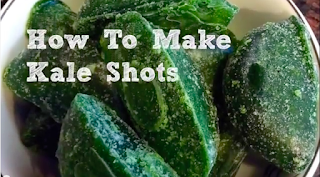 So in this video I am making Kale Shots, as I call them. They are just 1 ounce cubes of pureed kale. I don't know about you but I have such a hard time eating Kale. I think it is too bitter and I just can't get it down. And using it in smoothies, I just wasn't getting through all of it in a week. So my solution is to puree it up and freeze it. And one once is equal to like 4 cups of Kale. And it is totally masked by Shakeology, and a banana or in your green smoothie. You will still taste it a little because it is so bitter but it won't be like it is in a salad or just straight up. Let me know what you think of the video, subscribe! And hope you join me on this next adventure!